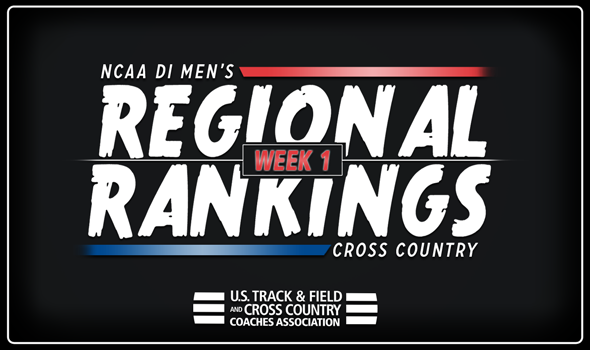 NEW ORLEANS – We are 11 days into the 2018 NCAA Division I Men’s Cross Country season and not much changed between the preseason and Week 1 in the Regional Rankings, which were released Monday by the U.S. Track & Field and Cross Country Coaches Association (USTFCCCA). There were no alterations to any top-2 in any of the nine regions as teams are still getting their "sea legs" under them and still deciding when and where to debut their top runners. Once all of that is figured out, all bets are off and the Regional Rankings will undergo a makeover, for sure. Top-ranked Wisconsin did not race and second-ranked Michigan State sent its younger runners into battle at the Jeff Drenth Memorial. The Spartans, who were led by Nick Hirschenberger, packed up in the top-20 and finished runner-up to host Central Michigan. Indiana and Michigan swapped spots from the preseason as the Hoosiers are now No. 3 and the Wolverines come in at No. 4. Notre Dame jumped up from No. 6 to round out the top-5. Top-ranked Princeton competed at the Harry Groves Spiked Shoe Invitational this past weekend at Penn State and ran as a group. All seven of the Tigers finished between 27:31.1 and 27:31.6 with Gannon Willcutts leading the charge. Villanova did not race and remained stationary at No. 2, while No. 3 Georgetown withheld key impact runners at the Spiked Shoe. Fourth-ranked Penn State finished runner-up to Syracuse and fifth-ranked Penn rounds out the top-5. There wasn’t much racing in the Midwest Region and because of that, everything remained the same from the preseason. Iowa State is No. 1, followed by second-ranked Oklahoma State, third-ranked Illinois, fourth-ranked Minnesota and fifth-ranked Bradley. Northern Arizona showcased its strength at the George Kyte Invitational two weeks ago. The Lumberjacks raced all of their key athletes as they swept the top-5 scoring places en route to a perfect score. Peter Lomong won the individual title as he covered the 4.5-mile course in 22:59.3. Lomong was followed by Matthew Baxter, Tyler Day and Geordie Beamish. BYU is still No. 2, followed by No. 3 Colorado, No. 4 Colorado State and No. 5 Southern Utah. The Rams scored a head-to-head win over the Buffs at the Wyoming Invitational two weeks ago, but it’s still too early in the season to make too much of a dent in the rankings. There were no changes to the top-5 of the Northeast Region as Syracuse, Iona, Stony Brook, Providence and Boston University remain in order. The Orange, Gaels and Seawolves all competed in the first two weeks of the season, yet held out key runners. Syracuse won the Harry Groves Spiked Shoe Invitational hosted by Penn State while Iona had three freshmen who went 1-2-3 at the Marist Season Opener. Top-ranked Alabama, second-ranked Middle Tennessee and third-ranked Ole Miss all raced, but none unveiled a true top-7 yet. Fourth-ranked Florida State and fifth-ranked Tennessee also competed, but like those teams in the top-3, have been building up to bigger meets later in the season. There weren’t any changes to the top-4 of the South Central Region. Arkansas is still No. 1, followed by No. 2 Texas, No. 3 Texas A&M and No. 4 UT-Arlington. While all four of those teams competed in the opening weeks of the season, little was found out about their rosters as they held back many of their top runners. The biggest jump in the South Central Region came from Rice, who popped from No. 6 to No. 5 after winning the Norry Hersey Rice Invitational over Texas, Houston and several others. Campbell debuted Amon Kemboi and Lawrence Kipkoech at the Elon Opener two weeks ago. Kemboi and Kipkoech went 1-2 and were followed by Godwin Kimutai in fourth place. Other than that, the Fighting Camels struggled to find their footing and barely held off Duke. Not much else has been found out about second-ranked Virginia, third-ranked NC State, fourth-ranked Furman or fifth-ranked Charlotte, which round out the top-5. Top-ranked Portland, second-ranked Stanford and third-ranked Oregon all competed in the first two weeks of the season and ran controlled efforts. The Pilots didn’t have their top-5 at either the Viking Rust Buster or Oregon XC Preview, while the Cardinal packed it up with a negligible spread at the USF Invitational and the Ducks flew together at their home opener. Washington State and UCLA are still the fourth- and fifth-ranked teams in the region.